In 1918 there was an angry public clash between the Victorian Police and the Fitzroy Council which played out through the press. It all started when a newspaper quoted a police report by a Superintendent Davidson in which it was stated that "Fitzroy was the home of Melbourne criminals generally." Fitzroy Council was so offended that they led a deposition to the Chief Commissioner. They labelled the Criminal Investigation Branch incompetent and were quoted in the media as saying that "some officers of the Police had become too fat to chase after a lizard let alone a criminal." Despite the misgivings of the Chief Secretary, the Chief Commissioner stood by his Superintendent and commissioned reports from other members of the force to support the claim. One report submitted that what had been said was actually an understatement and that proof of Fitzroy's criminal nature was borne out by the shooting crimes which had occurred since the furor began. Several reports pointed out that some of Fitzroy's streets were practically all sly grog shops, brothels and dens of thieves. Other reports not only supported the original statement with statistics but set out the factors which contributed to the criminal nature of the suburb. Inadequate powers in regard to closing brothels and disorderly houses and the difficulties experienced in gaining sufficient evidence to prosecute them. Within several months of these reports the suburb had erupted into a gang war known as the Fitzroy Vendetta. 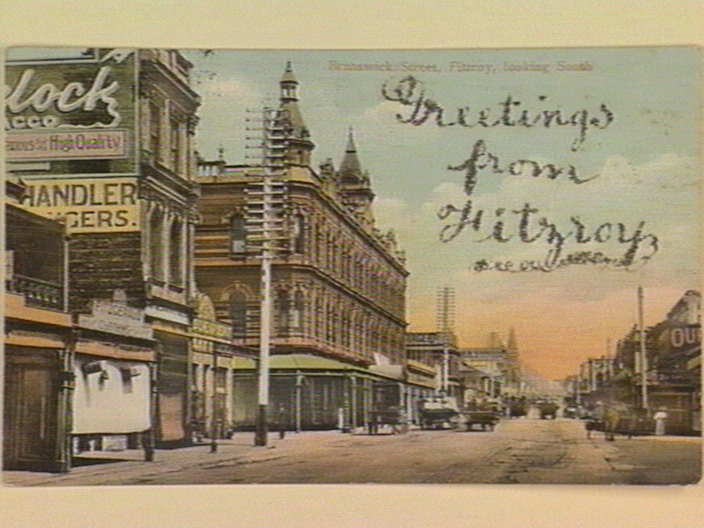 Melbourne Historical Crime Tours follows the story of Fitzroy's journey from the affluence of the 1890's through to the notoriety of the 1920's. Every house has its story, every street one thousand more. Explore the streets and alleyways of Melbourne's old Fitzroy through the eyes of its cops and crooks. The Fitzroy Crime Tour goes for 2 hours every Thursday, Friday, Saturday and Sunday and starts and finishes at The Workers Club, 51 Brunswick St Fitzroy. Thursday GANGSTERS & CANDY STORES (Laser Projector Night Tours) at 6.30pm, Starting from the Coopers Inn, 282 Exhibition St Melbourne. Saturday GANGSTERS, BROTHELS & LOLLY SHOPS tours at 4.30pm. Starting from the Coopers Inn, 282 Exhibition St Melbourne. School groups also catered for. If you wish to organise an educational tour for students please send a message through the 'Contact Us' option on this site's homepage. The suburb of Fitzroy is right on the edge of Melbourne's CBD and easily accessible by public transport.